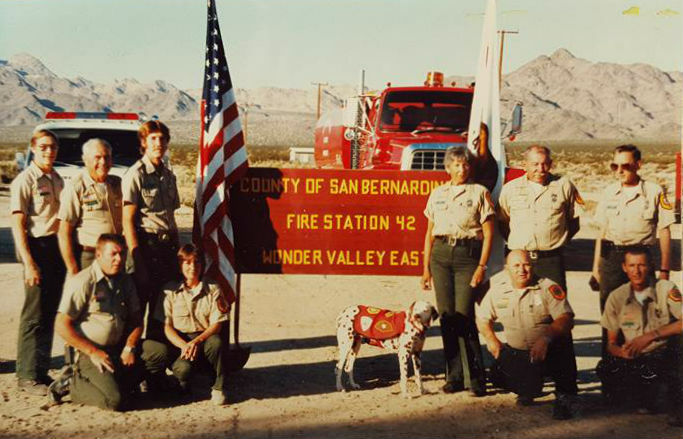 On July 25, 1987, Wonder Valley Fire Chief Jack McConaha tendered his resignation to San Bernardino Fire Chief Glenn Newman. A. Lack of support and participation of the residents of Wonder Valley to their fire department. Before I became fire chief in 1978, the residents and weekenders were all very involved and supportive of their fire department. Most of the original founders and supporters have now passed away, leaving the new residents who do not get involved in supporting or contributing to any of the activities needed to make Wonder Valley and vicinity a successful growing community. To those few residents, in a population of around 2,500, who worked very hard to support the fire department, I express my deepest thanks. Because of these ‘old timers’ (that I love so dearly!) I have hesitated to resign at an earlier date. B. The fire department provides fire and rescue and public service to the community of Wonder Valley with just 12 firefighters. They respond seven days a week, 24 hours a day, to assist the residents, weekenders and travelers in Wonder Valley, Highway 62, Highway 66, Amboy Road and Interstate 40. I have advertised and even begged for volunteer pay-call firefighters from the residents of Wonder Valley and Highway 62, but got none. These residents sit at home, watch TV and drink at the local bars, rather than assist their fire department. It’s not right that my firefighters work five to six days a week at their regular jobs and also seven days a week, 24 hours a day, on call to respond with help for the residents, who in turn, do not want to support or participate as members of their fire department. The more things change, the more they stay the same. As in 1987, so in 2016, almost 30 years later.